When 108 Garage opened last October, the tiny restaurant soon became the object of rapturous acclaim. It seemed that, before the paint had even dried, the country’s most esteemed restaurant critics were professing the restaurant to practically serve the best food since the invention of sliced bread, despite the furniture. Needless to say, the matter of booking at table at a reasonable dinner time is still no mean feat. In the shadow of Erno Goldfinger’s iconic Trellick Tower, tucked away on a side street towards the Ladbroke Grove end of Portobello Road, 108 Garage seems to be an instant recipe for success. Slightly off the beaten track location; check. Fashionable mismatched furniture and staff to match; check. A constantly changing menu of boundary pushing food, which favours on-trend ingredients but is never gimmicky or pretentious? Absolutely. Arriving for a lunchtime booking, the praise that’s already surrounded 108 Garage is understandable, almost instantly. First, there’s the matter of sympathetic lighting, accentuated by natural light that trickles through the large windows on a bright spring day. Also, every member of staff appears to be under the age of 30, but all have a driving passion for the food and drink served, happy to explain an outlandish ingredients or provide glowing recommendations. The kitchen, on the other hand, is over seen by Chef Chris Denney, having previously held positions in the kitchens of chefs that include The Square, Nuno Mendes’ Viajante and three Michelin-starred Piazza Duomo in Alba, Italy. Here, the menu is typically British, but dragged into the 21st century by impeccable technique showcased, plus exquisite ingredients rarely found outside Michelin-starred kitchens. A pre-starter of chicken liver parfait, for instance, is a far-cry from the drab concrete paste that conjures images of the restaurants relatable to Fawlty Towers. Here, the chicken liver parfait (£4) is silky as though it’s been sieved extensively, without too much cream to detract flavour, and tastes remarkable spread onto some of the best sourdough on offer in London, at the moment. Starters are equally impressive. ‘Crispy pig’s head’ (£10) offers a large nugget of slowly-braised head meat breaded with panko and deep-fried, elegantly draped with a strip of fatty lardo and joined by segments of white peach to cut through the richness. Insalubriously sensational, the brawn croquette is an example of exceptionally executed comfort food – refined yet modest, far too good to share. Even better is a tartare of striking pink sea trout (£12) in an equally lurid vegetal juice of nettles, atop a savoury panna cotta spiked with fierce horseradish. Unexpectedly, the horseradish – although powerful – refrains from overpowering the delicate, oily fish and further showcases the high level of skill within the kitchen here. Another starter of seasonal asparagus shavings (£13) employs matcha powder, dollops of confit egg yolk and a paper thin cracker that adds texture and aesthetic height. Another well-judged dish, the luscious egg yolk is, naturally, remarkable with asparagus, yet the matcha doesn’t quite prevail on the palate – perhaps quite fortunately. On the other hand, a heavy handed garnish of leaves turns the dish into a texturally deranged salad. The simplest dish sampled, three bulky veal sweetbreads (£13) are seared with an outer-caramelisation similar to that expected from a properly cooked scallop, while perfectly soft in the middle, sat atop a simple mattress of fennel and tart sea buckthorn. A dish of Jacob’s Ladder (£24) – also known as beef short rib – prizes an under-loved cut of meat, often reserved for pretend American barbecue restaurants, disrespectfully slathered in sweet barbecue sauce. Best cooked for at least four-to-six hours, the hunk of beef served here has a majestic pink interior, but could benefit from an extra forty-five minutes’ cooking, at least, for optimum tenderness. Elsewhere on the plate, the accompanying ketchup of black garlic is alas unpleasant, still a tartare of beef flecked with bone marrow is simply outstanding. I’d happily have eaten a whole plateful as a main course, on its own. At the time of visiting, the menu at 108 Garage offers just two desserts (plus a cheese selection). ‘Buttermilk, chervil, Gariguette’ (£8) leaves a lot to the imagination. A quenelle of formed buttermilk is topped with a scattering of frozen, desecrated French Gariguette strawberries that melt in the mouth with a syrupy-sweet flavour, like a posh Slush Puppy – a good thing, of course. In contrast, a sorbet of chervil tastes of parsley and restores balance throughout the dish. Chocolate cremeux (£7), on the other hand, is everything that a chocolate dessert should be: rich, decadent and delicious. It is the artichoke ice cream on the side, however, that’s absolutely inspired. With a setting that provides a genuine blank canvas for the food to take focus, the food served is always cleverly executed, well-balanced and (mostly) delicious. Offering just a simple list of key ingredients, the menu under-promises but over-delivers with each dish. 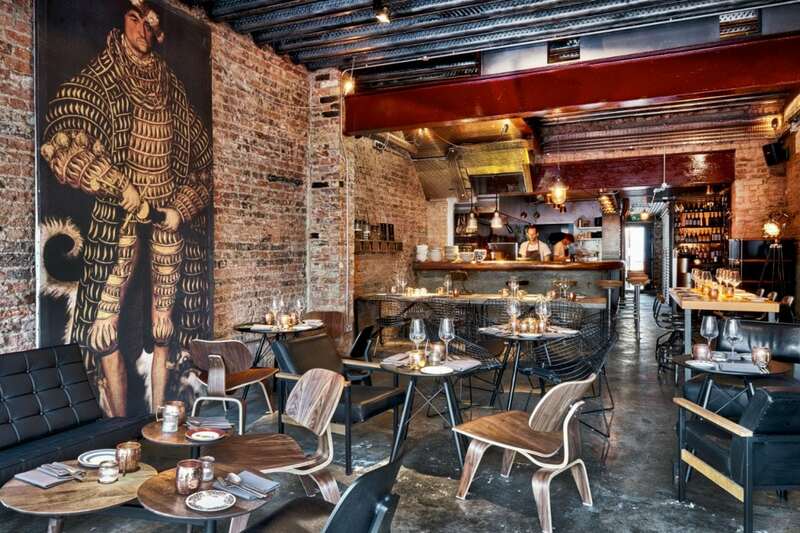 Above all, 108 Garage may be Notting Hill’s best new opening since Marianne Lumb’s eponymous restaurant? 108 Garage can be found at 108 Goldborne Road, London, W10 5PS.